and also trees not so empty, but not on this road, not the road we chose at lunchtime, not the road we chose when i said drive me somewhere to take a picture, and we drove a few miles out of town, me in the passenger seat, camera not even in hand, staring at the empty trees and dullness of the day, nothing speaking to me. i let a blue and white painted wall pass by, and longhorn cattle, and donkeys and cows and trees full of space between their branches, and i thought of elaine's east texas post of pine trees and green, and how i'd commented and agreed it looked more like autumn out there and thought about how wrong i'd been. here, on this road, it looked like january. i remembered years and years ago, driving an employee to dallas, he newly transplanted from minnesota, his fiancee flying in to join him here in his new texas life, remembered it was also a january drive, remembered the drive back as she took in the gray and nakedness of it all, asking is this what it always looks like? , blue skies bright overhead notwithstanding. it is january and we are waiting for spring. never mind that last year it snowed in february. never mind that is officially winter, never mind there is coldness still ahead. we are waiting for spring, the tulip trees all budded with promises of pink just weeks away, football only one game away from over. never mind. it is january and we are waiting. after lunch, back in the ever-wonderful michael's jeep, the surprise of a cat's head popping up from the deep basket atop a table outside the cafe door, snuggled into a blanket against the weather, called for the camera, but instead we just laughed and headed back and once again i watched the trees and thought of january and finally said pull over here and i thought i will photograph the month. at home, i stopped to talk to a neighbor, to say hello to her new son, and she said it's so dreary now, i can't wait for spring. and perhaps that is why i haven't been here, haven't been writing, haven't been photographing or painting or crafting or gluing, have just been reading and cleaning the house, preparing for the dollhouse project, getting my real house in order. perhaps it has been just waiting, but if so, it has been a much needed waiting, all budded with promises of its own. Waiting, yes. I understand this. I get it completely. sometimes, even though it makes us impatient, waiting is a good thing.it is too early here to wait for spring, still two months left before it begins to be near, but still, i wait. and it's okay, isn't it? we will get there. trees amaze me so .. as does your waiting through January and beyond ..with buds around the corner..
i am good with the waiting one minute and not so good the next. i bring spring plants into my home for comfort and snap 78 pictures of them in very little time. and i watch the trees and i know you are right. it's okay to wait. actually, good to wait. and get our houses in order while it is still cold. Cookies again!! One of these days yes ;) I'm on a road trip to salt lake city with tiffany for a photography workshop, saw you comment on my blog and started writing this right away. Now it's many hours later and I'm back to Finally finish this comment. 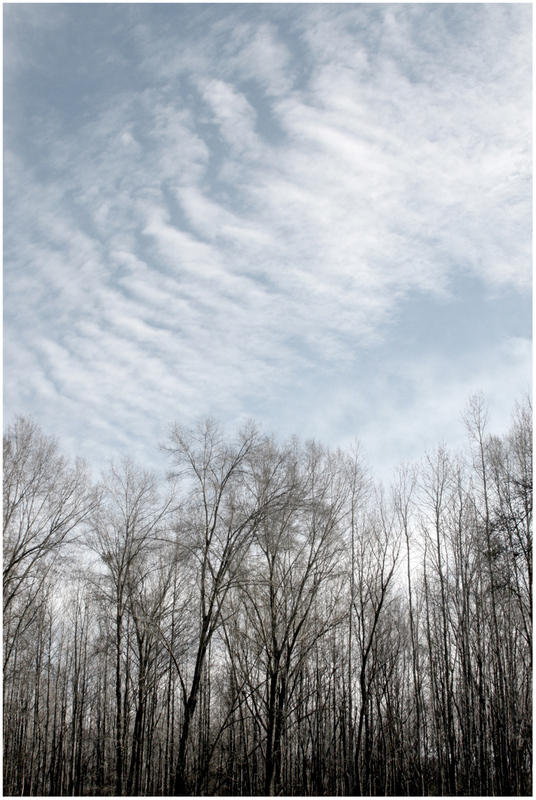 Love your quiet, empty sky and straight reaching for the clouds trees. Tall timbers take a rest. Nice. Aren't blogger friends projects the best? So motivating and exciting and old-fashioned fun! I am waiting along with you for spring, watching for signs in the dreary sky. Looking to the ground for new growth that is just beginning to make an appearance. Dreaming of dancing in the sunshine. And dreaming of my next dollhouse. I love waiting that's all budded with promise. Both the waiting and anticipation itself and your beautiful image. I always feel quiet at this time of year, too boxed in by the snow and the cold and the gray skies. Usually, I vanish from the blogverse at this time of year, not to return until well into summer. I need that quiet, but I always let it stretch on too long, until I have reached the breaking point inside. So I'm trying really hard not to vanish this year--I may not be as talkative as usual, but I'm determined to be present. So here I am, suddenly babbling about being quiet. You have no idea how much I wish I had that POV this very moment, the one from which you took this photo. Sigh. Gorgeous. BTW, I just awarded you the Stylish Blogger Award (today's post). Enjoy it! I loved those words about not taking the photo...letting things be seen with your eyes, but not your camera. As much as I love that I see the world in pictures, it can be so freeing to take a break sometimes and just see things as they are, and then let them pass by. first, louisiana . . .